LIBERAL, Kan. – Only suffering from two loses on the season, the No. 8 Seward County women’s basketball team has now enacted revenge on both teams, defeating Coffeyville 93-56 Wednesday night inside the Greenhouse. In their two revenge games, the Lady Saints have beat their opponents (Barton and Coffeyville) by an average of 36 points. Threes fell early and often for the Lady Saints (22-2, 18-2), scoring all 15 points to start the game from behind the arc. Silvia Veloso started the onslaught of threes by drilling one from the corner on Seward’s first possession. By the time the consecutive points from threes ended, it was 15-7. Seward wasn’t done with three pointers in the first quarter, however, as Mollie Mounsey drilled a corner three as time expired, taking a 23-14 lead into the second quarter. Seward didn’t miss a beat in the second quarter, as Amy Scott hit another three for the Lady Saints in their second possession. The Lady Saints used a 10-2 run through the middle of the quarter to extend their lead to 25-17. Another Mounsey triple ended the run. Two Brennyn Seagler free-throws pushed the lead to 20 just before halftime, making the score 47-27 at the break. At the half, the Lady Saints were shooting 43.3 percent (13 of 30) from the floor and 45 percent (9 of 20) from behind the arc. Seward held a 12-to-1 made free throw advantage over the Red Ravens at the half. The Red Ravens kept the Lady Saints from pulling any further ahead for much of the third quarter, until Vanessa Caro connected on a jumper to start a 13-4 run over the final four minutes of the quarter. Caro was responsible for eight of the 13 points during the run, and scored half of her total points during that four-minute stretch. The run extended the lead to 30 points, by a score of 73-43. 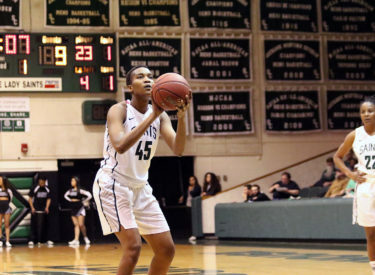 It was much of the same in the fourth quarter, as the Lady Saints connected on four three-pointers in just over five minutes. The final three by Chelsea Lazenby gave the Lady Saints their largest lead of the night, putting the score at 90-50. The Red Ravens would cut the lead to 37 by the end of the game, with the Lady Saints winning 93-56. Seward finished the game shooting 49.2 percent (31 of 63) from the floor and a season-high 47.1 percent (16 of 34) from behind the arc. The 16 three pointers were the second most in a single-game this season. Four Lady Saints scored in double-figures, led by Vanessa Caro who scored a career-high 16 points, making 4-of-5 from behind the arc. Amy Scott (14 pts), Vilma Covane (12 pts) and Silvia Veloso (10 pts) joined Caro in double-figures. The Lady Saints will hit the road to take on Allen at 2:00 p.m. on Saturday (Feb. 10). Allen will live-stream the game and it can be heard on 107.5 KSCB with Brock Kappelmann (pxp) on the call.